One major theme that our Integrating Habitats winning team entry was the ability to address the interwoven patterns of urban fauna and urban form. There are numerous reasons why keeping a vital mix of flora, and fauna, along with people, is essential to the proper functioning of cities and urban processes. 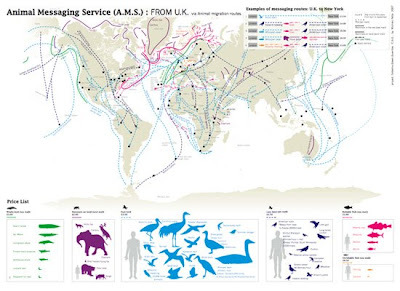 This investigation of species flows really shaped the entire site plan - to avoid conflicts between human users and fauna while maintaining possible interactions between the two. 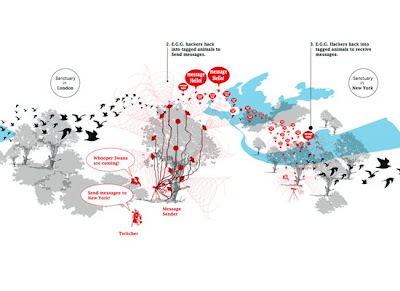 :: Habitat/Site Flows - image via Jason King, et. al. There are some interesting precedents and imagery associated with this form of mapping - trying to capture the essence and interaction of development, urbanism, and habitat. These interactions are fleeting - particularly when you try to depict them in a two-dimensional media. They are also evolutionary, as we see from some of the recent information gleaned on the subject from a number of sources. First, the evolutionary modification. As reported in BLDGBLOG, via a story in New Scientist, as somewhat disturbing trend: City Songbirds are Changing their Tune. 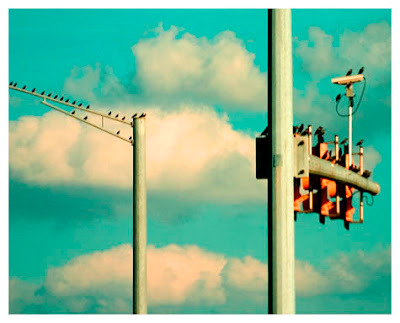 The article outlines the adaptations that city birds are making to be heard above the cacophony of city noises, such as changing the pitch, and frequency of calls. Our urban ecologists may have to re-tune to the city vs. rural species when spotting these specialized communicators. While notable and disturbing on a base level, it could actually create evolutionary splits in the rural / urban species of birds as they adapt to environmental stimuli (via BLDGBLOG): "If singing and hearing diverge enough, urban birds may be less likely to find the vocals of rural birds attractive, or even to recognise them as members of the same species. These changes could serve to eventually split populations into genetically distinct urban and rural species. Alternatively, different populations of the same species might adopt differing strategies to cope with urban noise, leading eventually to a species split occurring in birds living in the same neighbourhood." 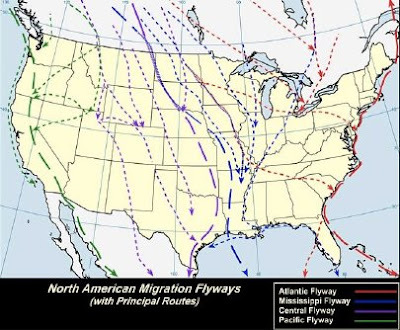 Macro-scale migratory flyways have typically been mapped as linear flows - and though they evolve - tend to stick to typical pathways that link vital stopover spots (marshland, lakes, wetlands, potholes, etc.). Well, that is until we either (1) remove, in part or wholesale, the stopover points through filling, developing, depleting habitat. Hunting takes a fraction, as well as winter habitat loss and other factors like building collision, predation by domesticated pet, and a number of other concepts - or - (2) disrupt the flow patterns in some way. 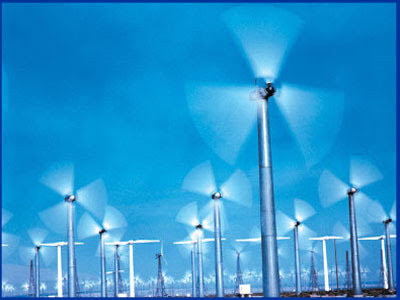 One item that is constantly discussed as we evolve new clean(er) technologies such as wind, it is interesting to see how these two uses interact - as they tend to occupy the same space. There is a common misconception (although not definitive one way or the other) that wind-turbines and bird migration are incompatible. A Treehugger posts attempts to illuminate some of this disparity (read the whole post), with a recap: "In the United States, cars and trucks wipe out millions of birds each year, while 100 million to 1 billion birds collide with windows. According to the 2001 National Wind Coordinating Committee study, “Avian Collisions with Wind Turbines: A Summary of Existing Studies and Comparisons to Other Sources of Avian Collision Mortality in the United States," these non-wind mortalities compare with 2.19 bird deaths per turbine per year. That's a long way from the sum mortality caused by the other sources." So as we narrow the focus to more micro-scale analysis - how do we determine and map these semi-predictable flows to a resolution that is adequate for real design strategies. 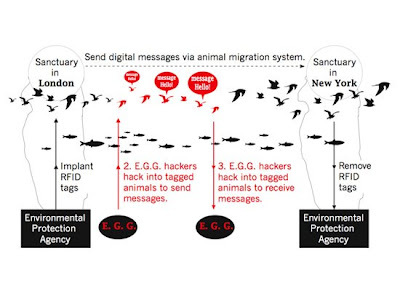 A recent post on Pruned on 'Faunal High Jinks' had a vision of some possibilities, using RFID technology is Michiko Nitta's 'Animal Messaging Service' (A.M.S.) which proposes a guerilla postal service to reduce our impact to the global ecosystem destruction. Pruned does a great job of giving an overview and the usual informative context around the project: "The A.M.S. 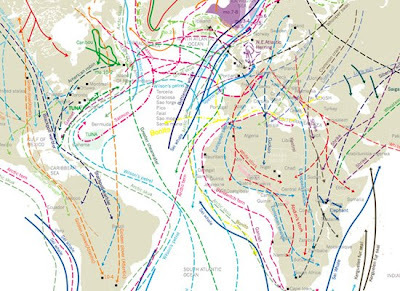 is an alternative form of communication whereby so-called extreme green guerrillas “send messages internationally by hacking into the animal migration system.” The environmental benefit of this is that it doesn't tie you to big corporations, as one would be if using the Internet and mobile phones, and unlike conventional postal systems, it doesn't leave a huge carbon footprint." And to turn it back around on this site and it's regular content, Pruned remarks: "What if everyone, to the ultimately surprise of Michiko Nitta, fully subscribes to her vision of the extreme green lifestyle and cities everywhere adopt the A.M.S. as the default mode of communication? What then would the physical form of the city be like if its networked infrastructure is based primarily on zoology? Is this where “vegi.tecture” reaches its true potential? " That would definitely have some interesting ramifications in the design of our urban areas, public space, buildings, and interstitial zones. Is it out of the realm of reality that we could and will design with this level of knowledge and understanding - truly veg.itecture that is proactive - both at a building and a city level. It is the 10 million dollar question. 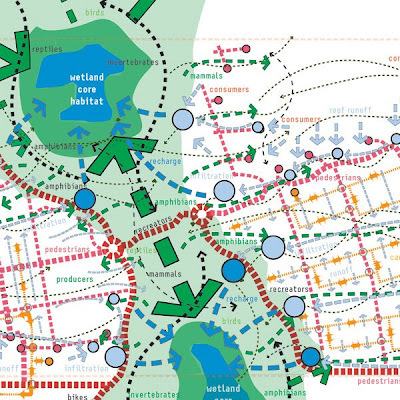 Not that we understand and implement based on our best information and knowledge - but how do we provide an accurate and sensible translation of science and information into design and placemaking. We often discuss lofty goals associated with sustainable design - but are we really accomplishing what we say? Do we actually create habitat? If so, is it correct and appropriate for the preferred species composition for our very artificial ecosystems? These are definitely not answers - but a way of leading us to ask the right questions. I often bemoan the artificiality of some of these statements... and habitat is one of the worst offenders (followed closely by heat-island mitigation, and water quality/pollutant uptake). We don't know enough yet about a number of our interventions, and it requires a significant amount of brio to make these claims if we don't have the proof and science to back it up. My thought on the changing face of the profession is that we will be designers, generalists, and interpreters... but projects, if we are to truly make them successful and sustainable, must become more collaborative - with a much larger group of collaborators than we are currently including. The onus falls on both parties. Science that is hyper-focused and non-transferable may be interesting but is hardly useful. Science can be crafted so results are able to be applied to situations in meaningful ways without over-generalization that renders the results useless. Designers need to be more open to including 'experts' on team (and for that matter, clients who have lofty goals need to be more willing to pay for additional consultants). We also need to be more diligent in our research, application and interpretation... essentially smarter, so our designs with nature don't end up making a passing reference to ecology and science, but really do either nothing, or contribute to the degradation. Perhaps what I'm talking about is all of us changing our tune - when it comes to doing better design and planning?